Jeffry Jahn, photo courtesy Arizona Repertory Singers. Yesterday I attended a concert of historic dimensions – a tribute concert to the memory of Arizona Repertory Singers’ conductor and musical director Jeffry Jahn. Jahn died suddenly in February after spending 25 years on the podium with this group. His death was a crushing blow to the community, and especially to ARS. Jahn was a very special man. Endowed with amazing musical and personal gifts, he had an encyclopedic knowledge, not just of the classical choral repertoire but also of opera, pop music and so much more. He had a special understanding of the human voice and knew how to bring out the best from individuals and massed voices on a sheer technical level. But great as his technical gifts were, his humanity amplified everything he did. Quick witted and hilarious in rehearsal, he had a way of breaking tensions when they needed to be broken and explaining what he wanted in a way that never put anyone down. Moreover he not only created the sense in his singers that he cared about them personally and professionally, he in fact really did. That did so much to inspire these volunteer singers to do their very best. Much of this I know from interviews I did recently with current and past ARS members for a tribute video I put together for this concert. But because I have been friends with several ARS members I heard these comments all the time over the years. Angela Hagen and I worked together at the Tucson Citizen for many years, and every Wednesday morning she would come in supercharged from the rehearsal the night before. “You’ve gotta see what we’re doing next,” she would insist. And it was always worth going to check out. During my own term as a music critic with the Tucson Citizen I often covered ARS concerts and sporadically attended their rehearsals. I was always amazed at the depth and breadth of the literature the group tackled, and the prowess with which they pulled it off in concert. But when I attended those rehearsals I knew why. Jeffry Jahn was simply one of the most complete musicians I had ever seen in action, and one of the most fun to watch at work as well. I was stunned, as was the community, on hearing that Jeffry had passed. But I had no doubt that his group would rise from the ashes, no matter how hard it would be to do so. After yesterday’s concerts members told me they couldn’t even sing in the first rehearsal after his death. The grieving was simply too overwhelming. And in the next few rehearsals after that it was truly hard going. They were foundering. But while the holes in their hearts were large and raw, they had advantages most singers will never know. They had 25 years of the special leadership, coaching and musical knowledge of Jeffry Jahn at their backs. They ARE the vessels into which he poured that incredible knowledge. They ARE the people he nurtured and moved steadily along. They ARE the Arizona Repertory Singers. And as yesterday’s concert proved, they still sounded like the Arizona Repertory Singers. The blend was warm and rich, the choral lines clean and well executed. The repertoire was broad and varied, and the program architecture moving and powerful. The chops were there. All was right in the world. Jahn’s wife, interim conductor and music director Nadeen Jahn, was now on the podium and received a standing ovation as she walked into the hall from the packed house at Catalina Methodist Church. She and the singers earned another by the program’s close. Clearly it was a very hard concert for all. But just as plainly they proved to themselves and the community that Jeffry Jahn was alive in their hearts, minds and all of the music making apparatus that they could bring to bear. The final Alleluia by Ralph Manuel was especially touching. The singers lined the church aisles, surrounding the crowd, lending the audience a special three dimensional window into the ensemble’s remarkable sound. Soulful and heart felt, it was a moment none in the hall will forget – moving to the core, yet somehow profoundly affirmative. 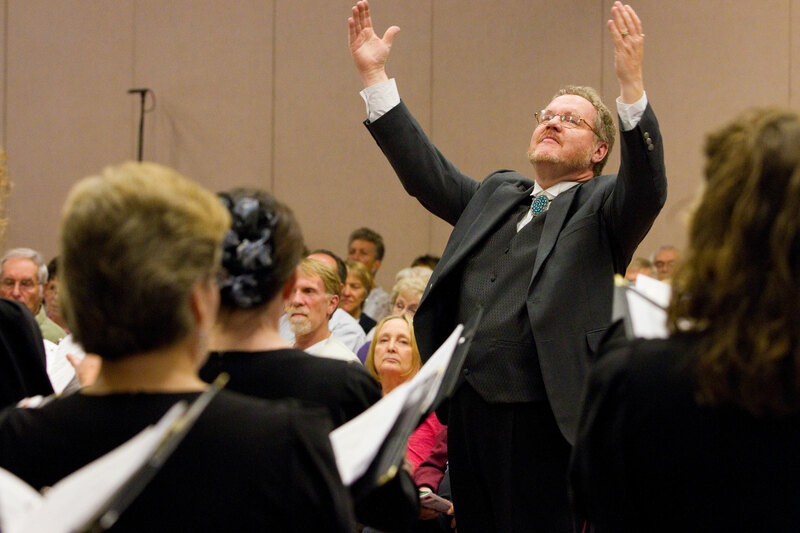 The Arizona Repertory Singers continue to fall back on their special training. And doing so will ensure not just their survival but their rebirth as one of Tucson’s most potent musical forces. ~ by Daniel Buckley on April 20, 2015. What a stunning article, Dan, and THANK YOU. A significant dimension of the beauty of this concert is that Jeffry CHOSE these pieces from amongst his favorites over the years. WE DID have five or six (GLORIOUS!!!!) rehearsals with him before he left us!!!! As for yesterday’s concert, our cups runneth over. Lovely article! Thank you so much for your work. It means a lot to those of us in the chorus and helps us through this period. We were all blessed to have had such a force of nature to teach us. What a beautifully written tribute and review. As a member of ARS, I have to say you captured perfectly our journey over the last two months. More than that, you captured the essence of Jeffry…his incredible giftedness, his wit, his kindness. Thank you for what you have shared! thank you for this post. I wish I could have been at Sunday’s concert. I sang with ARS for only one year over 20 years ago while on a sabbatical year. It was an unforgettable experience . It was a pleasure to work with Jeffry during that year. What a moving article about ARS! I am one of Jeffry’s cousins from Kansas and would have loved to be at this concert. I can picture in my mind how awesome the concert was by your description. I can also see Jeffry smiling down on his ARS. Kudos to you all! As an ARS member for most of the years between 1989 and 2013, my life has been enriched immeasurably by the experiences I shared with my fellow choristers under Jeffry’s insanely energetic and skillful lead. My own musical capability and appreciation for nuance grew each year, as did my undying appreciation for the magic of creating something beautiful together. My heart aches for and with today’s ARS members, and I have the utmost respect for Nadeen, who brought out the best in ARS on Sunday. Sharing love and memories. This is a wonderful posting for an incredible group of people who loved singing with Jeffrey Jahn. He certainly led ARS to be an asset to this community and we were fortunately able to share their concerts in many venues. Thank you for the wonderful article and tribute to Jeffry Jahn. I consider myself privileged to have sung with ARS for 13 years. Jeffry was truly larger than life. No one who ever sang under Jeffry’s direction will ever forget him. He encouraged every member of ARS to be the best that they could possibly be. He will be so greatly missed. Kudos to the current ARS members for Sunday’s concert, under Nadeen’s skillful direction! My heart is with you all.